Those of us who live in the Research Triangle sometimes forget that we are in the middle of a horticultural heaven. We are surrounded by outstanding public gardens and have some of the best nurseries in the world close by. 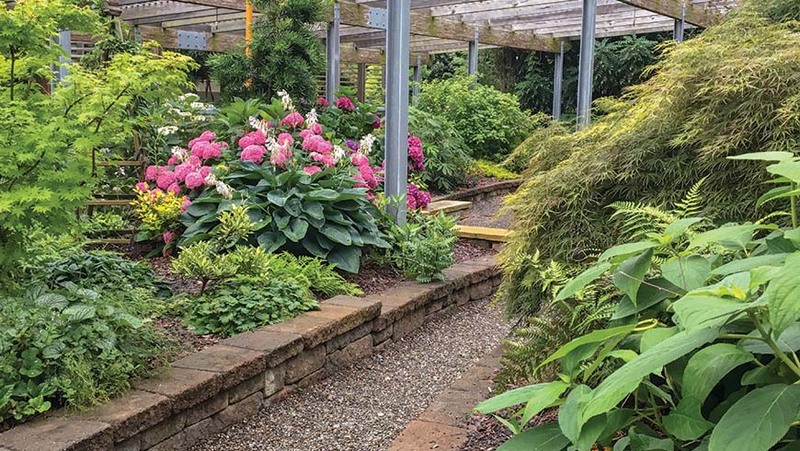 The JC Raulston Arboretum along with NC State University helped to lay the foundations for this mecca by inspiring multiple generations of gardeners, plantaholics, designers, landscapers, and nurserymen and women. It's easy when we're in the midst of this to lose sight of how lucky we are. Green organizations recognize the draw of the area and often want to hold their meetings and conferences here in town. In 2018 alone, we will be visited by the Magnolia Society International, the American Conifer Society, the Perennial Plant Association, and the Cultural Landscape Foundation's "What's out There?" tour. Many of these conferences will be open to the public for all or part of their time and I encourage you to come out and join in the fun. It takes more than interesting conferences to make the garden so successful though. Your gifts and support are vital to the JC Raulston Arboretum. It is always incredibly gratifying when our appeals are answered so resoundingly by our members. Donations made at the end of 2017 have already funded numerous projects that will be implemented over the next few months, including installing a green-wall vine system on the Bobby G. Wilder Visitor Center, creating a flowering lawn trial, adding festoon lights to the rooftop arbor, installing lights in the White Garden, renovating the Lawrence Border, and replacing carpets in the York Auditorium. Additionally, gifts were made to support three winter student workers (a first time opportunity), a summer intern, and a summer camp teacher. So many people helped to make these projects possible. While it is impossible to adequately thank everyone, I would especially like to recognize Doris Deal and The Deal Foundation, David and Karen Duch, Richard and Amelia Lane, Jerry and Nina Jackson, Bobby Wilder, Rufus Edmisten, and Margie and Keith Collins for their leadership gifts. Their support—and yours—make the JCRA such a thriving center of horticulture. There are many people to thank for their continued support. In an effort to conserve resources, the full 2017 annual report is being offered on the JCRA Web site at https://jcra.ncsu.edu/publications/annual-reports/ instead of printed copies. Collecting plants has been a vital piece of the JCRA's mission since J. C. set out for South Korea and Mexico. The global perspective, partnerships, and plants all make these endeavors well worth their cost. Plants raised from the seed collected are studied and shared with other botanical institutions, nurserymen, plant breeders, and ultimately with our members. Enjoy an excerpt from the travelog of my most recent trip to China below. You can find the rest at https://jcra.ncsu.edu/travelogs/. Contact Lisa Meares at (919) 515-1139 or lameares@ncsu.edu to learn how you can help support plant exploration by the JCRA. 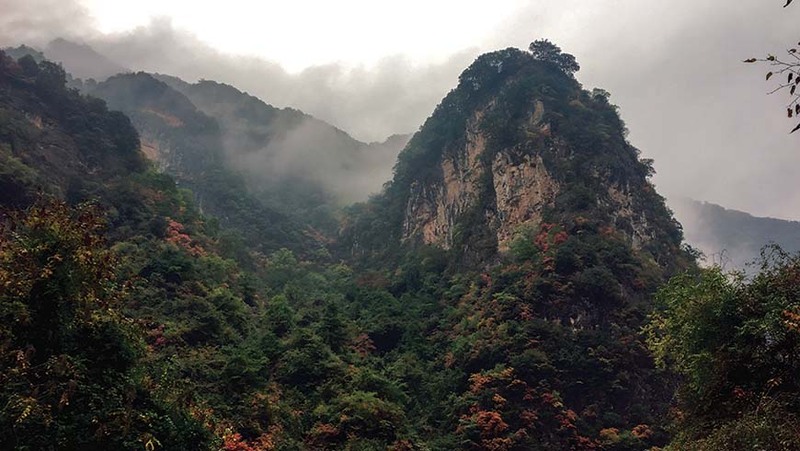 After a speaking engagement in Atlanta, I flew out to Shanghai with plans to collect on Wuyishan in southeastern China on the border between Fujian and Jiangxi and then head north to central China to explore the Qinling mountain range in Sha'anxi province. I was met as usual at Pudong Airport by good friend, nurseryman, and veteran seed collector, Liu Gang. I was in China well before my traveling companions, Scott McMahan of the Atlanta Botanical Garden; Dan Hinkley, Heronswood Botanical Garden; and Ozzie Johnson, arrived so we headed straight to the hotel outside Chenshan Botanical Garden. I awoke after a good night's sleep to find the rest of the entourage had arrived late and were ready to go—although there was some reproach for not having cold beer waiting for them. A morning tour through the growing facilities at Chenshan Botanic Garden to see some newly collected plants—especially hydrangeas and a few aucuba—and some amazing variegated Tetrapanax followed by a quick hello to colleague Min Deng, an oak expert with the Chinese Academy of Sciences (CAS), and we headed to the train station for the three-hour trip to Wuyishanbei. Scott, Dan, Ozzie, and I accompanied by Binjie, the curator of the CAS herbarium and a Chenshan gardener and seed collector picked up a couple of rental cars and headed to Wuyishan, arriving quite late in the evening. We stopped on the way for dinner and to pick up some fruit from a small roadside vendor. Interestingly, the vendor did not accept cash. Instead, he took money through a mobile app called WeChat which seems to combine most of the aspects of Facebook, Instagram, Amazon, instant messenger services, PayPal, and Apple Pay. We woke up bright and early at our hotel in a beautiful setting surrounded by a landscape of heavenly scented flowering osmanthus. We set out after breakfast to head up the mountain, a very tightly controlled area for which Binjie and CAS had procured all the necessary permissions and documents. Within minutes of walking along the roadside, we saw some very interesting things including gentians, toadlilies, and a new genus for me, Hanceola exerta with deep violet flowers. Just down from the hotel was a small arboretum planted with trees we were told could be found on the mountain. Specimens like Torreya jackii with long, elegant needles; Illicium minwannense; and a curious boxwood, possibly Buxus linearifolius, with long narrow leaves had us all eagerly anticipating the hike to come. The local gendarmes stopped Binjie and after some rapid back and forth, we could see a problem looming. After multiple phone calls, much discussion, and very obviously irritated looks, we were informed we would need to leave the entire area. A policeman watched over us as we packed up the cars and headed out very disappointed. The one bright spot for me was a redbud we passed on our way out of the Wuyishan National Nature Reserve. We stopped long enough to check it out and found it was Cercis chuniana easily recognizable due to its diamond shaped leaf as opposed to the usual heart-shaped ones. The tenure of any plant in the JC Raulston Arboretum has never been meant to be permanent. Our overall mission is to evaluate the suitability of plants to the growing conditions of this region, and because of this, plants come and plants go. In no other part of the Arboretum is this truer than in the Lath House. I recently finished a review of all plants in this garden. I imagine that the growing conditions in the Lath House must be close to those of a Garden of Eden. The soil mix of PermaTill and compost is well drained and kept evenly moist. The lath provides a very bright shade, and only the most ardent sun-loving plants want for more. Most plants thrive. It was high time to decide on the fate of the Lath House denizens. It's not exactly accurate to say that some plants slated to be removed are victims of their own success, but many of them have gotten too tall or spread too wide to remain. All the plants in the first case are woody plants which are not allowed to grow taller than the roof. Some of the shrubs have also spread too wide, most notably the Helwingia japonica, that odd dogwood relative which bears its flowers on the leaf blade. It spreads underground and has made quite a wide colony. Yet most of the other land grabbers are herbaceous perennials. A few have spread at an alarming rate and the final decision might be to eliminate them from the Arboretum. The other herbaceous perennials ready to graduate from the Lath House will be dug, divided, and added to other locations. A considerable number of these herbaceous perennials are ferns including several maidenhair ferns (Adiantum) and bamboo ferns (Coniogramme). Occasionally, a plant is propagated first before it is transplanted so there are backup plants if transplanting is unsuccessful. 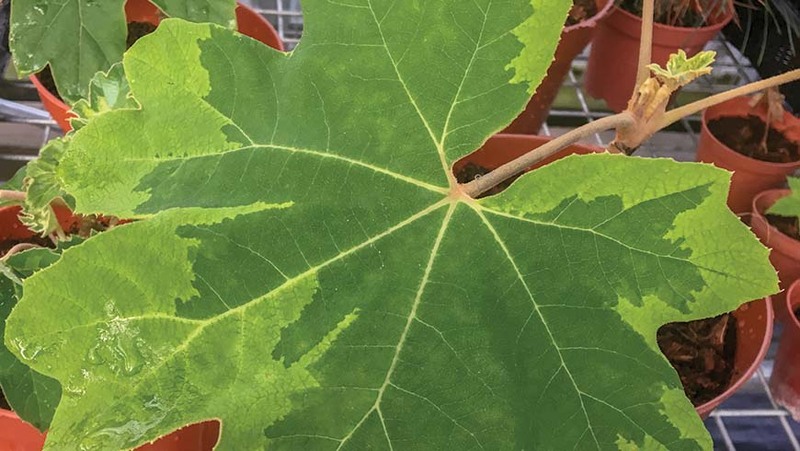 The JCRA plant database allows quick determination of the plant's fate if the plant in question is the only one of its type in the collection. For instance, Aucuba japonica 'Hosoba Hoshifu' is in several other locations and also is now widely available, so it is less important to preserve the plant in the Lath House. Will these plants thrive in real-life growing conditions outside the Lath House? Well, time will tell. So why remove them if they might die once faced with less than ideal conditions? While it's been proven that they will tolerate our region's temperature extremes, once planted out in the ground, it can be determined if they tolerate real soil and drought and the other vagaries of this climate. This kind of trialling is a fundamental purpose of the JCRA. What is the fate of the plants remaining in the Lath House? In years to come, some will have grown enough to move out. Some might remain there because it is the best location for them. A few special plants will be moved to the JCRA nursery for bulking up for eventual naming and distribution. There won't be blank spots for long. We have plenty of plants in the nursery and some of these will go in the Lath House. New seeds, cutting, and plants arrive from around the world all the time. Most recently, seeds arrived from the Qinling Mountains in Gansu, China. Keep an eye out for these new additions in the future. So, take a deep breath if you need to and welcome the dynamic nature of the JC Raulston Arboretum. In November 2017, the North American Rock Garden Society held their annual meeting here in the Research Triangle of North Carolina. Among the highlights of the meeting was the award ceremony where staff and members of the JC Raulston Arboretum figured heavily. Tim Alderton was presented the NARGS Award of Merit. 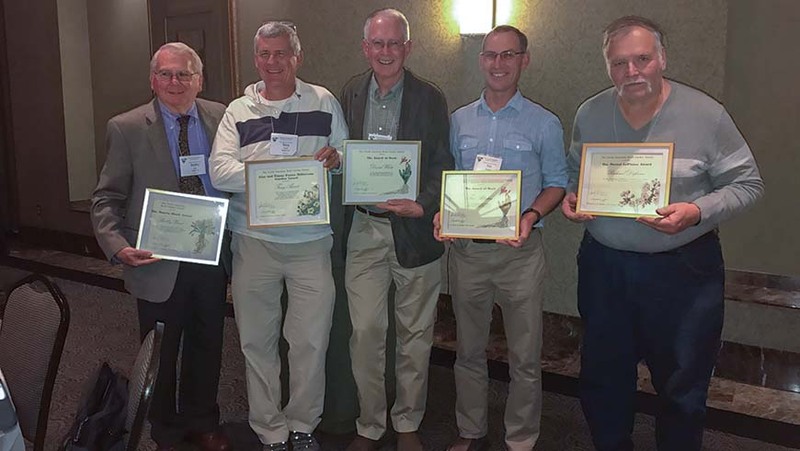 Other recognized JCRA supporters included J. C. Raulston biographer Bobby Ward (Marvin Black Award for promoting NARGS), Tony Avent and Nancy Goodwin (Millstream Award for Outstanding Garden at Juniper Level Botanic Garden and Montrose, respectively), David White (Award of Merit), and Richard Dufresne (Marcel Le Piniec Award for extending and enriching plant material available to gardeners—specifically salvias). Congratulations and thanks for your hard work and dedication. In addition to the national awards, the Piedmont Chapter of NARGS awarded Christopher Glenn the Award for Service for his work helping with speakers and A/V, and promoting the NARGS educational programs and meetings. If you are interested in checking out the outstanding NARGS programs yourself (and they're about a whole lot more than rock gardening!) come to one of their monthly meetings co-hosted by the JCRA. Admission is free for JCRA members. It's official! The Arboretum has been selected by NC State University's Office of Waste Reduction and Recycling (WRR) to become a Zero Waste Workplace. While this designation is exciting, it does beg the question: What exactly does that mean? The Office of WRR conducted research for practices to reduce waste on campus. We adopted these measures, including bin optimization and composting clean waste, on December 13, 2017. We're honored to be selected and thrilled with the $6,381.32 in funds provided by the university to get us started. Visitors will notice the new collection bins and signage, but they won't see the people and pieces behind the scenes in place for our initiative's success. From housekeeping adaptations to compostable bags, going zero waste is an involved process that requires careful thought and financial consideration. WRR has already put a tremendous effort into the program. In 2015, they produced a Waste Characterization Study to analyze the collected waste from the university's academic and administration buildings. This collected waste contained 38% compostable material and 22% recyclable paper and containers that were going straight into landfills. 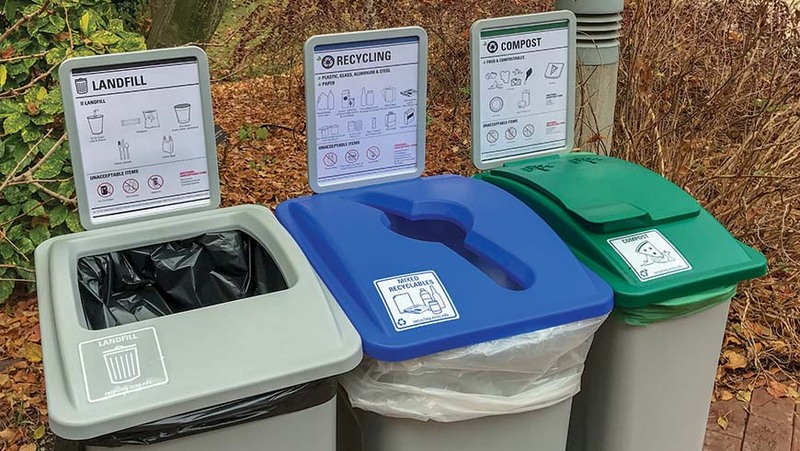 WRR started their pilot program shortly thereafter, which has gained momentum and created a demand to convert more university facilities to a Zero Waste Workplace. The program has vast benefits. Stakeholders and advocates of the Zero Waste Workplace will see the annual savings from the elimination of desk-side bag liners and the labor costs from housekeeping staff no longer taking the time to line them. But these financial benefits are only a small fraction of the impact that sustainability has on our environment. WRR selected the Arboretum for conversion because it is a mixed-use facility with a diverse audience that has the potential to educate an abundance of people about composting. Even though we started the program in December, we are still thinking about what goes where! We're learning and so will you. Please keep in mind that the program is utilizing recycling and composting channels the university already has in place. We are only managing waste that is generated by our organization. While we are composting the used paper towels in our restrooms (which has a big impact) along with food and some packaging in our breakrooms, and recycling other mixed-use products such as paper, cardboard, and plastic bottles, we will not be able to recycle every item identified with the familiar recycling triangles. Additionally, caterers and large groups will still be asked to remove and recycle their own waste as it is cost-prohibitive for us. Our team at the JCRA would like to say thank you to the team at the Office of WRR for leading the charge in waste reduction and recycling. We are very proud to join other NC State facilities in striving for a Zero Waste Workplace. Our commitment to sustainability doesn't stop with the Zero Waste Workplace. We are also partnering with the North Carolina Compost Council to create a professional field day focusing on best sustainable practices for Green Industry professionals on July 26. From the outside looking in, our vibrant Children's Program is filled with smiles and giggles of discovery and delight. It appears to be a well-oiled machine operating seamlessly with dedicated volunteers under the direction of one very calm and confident program coordinator, Elizabeth Overcash. I'm here to tell you that it is all that and so much more. My front row seat as assistant director has given me a real understanding of the details and intricacies required to provide quality youth education at a public garden and it's definitely not as simple as it may seem. 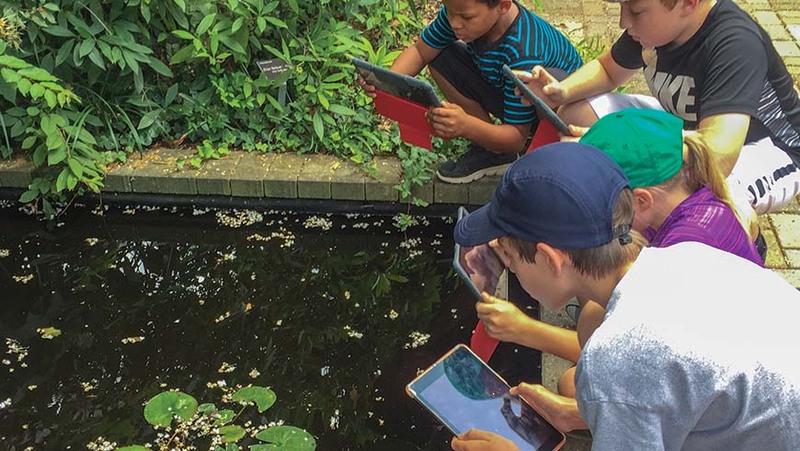 Not only is there great attention to the details, procedures, and practices needed to keep everyone safe, there is also a tremendous amount of research, collaboration, thought, and organization put into developing and implementing the activities designed to teach these young, energetic minds about horticulture. Elizabeth's passion for learning, science, and education keeps the Children's Program moving forward and in line with our mission and high standards. She brings the Arboretum and NC State to the table with other learning institutions, sharing our program successes while also listening to and learning from others. Launched in 2011, the program has systematically grown to keep pace with its budding participants. Families who discovered us when we first dipped our toes into youth programming now have children who are eligible for our new middle school summer camps—it's our fifth year of summer camps, as hard as that is to believe. For all that has changed in our programming, there is one piece that has remained the same. We employ one—yes, only one—part-time children's program coordinator. Beyond Elizabeth's dedication and enthusiasm, what has enabled the JCRA to develop such a strong program in such a short period? Volunteers seem to be a common thread in the Arboretum's successes. In 2017, the Children's Program volunteers worked 728 hours. That's 91 eight-hour days! From program prep to camp support, these volunteers do it all. They participate in ongoing program training and are integral in our evaluation and facilitation of inclusive programming designed to educate in a natural setting. This core group of volunteers helps year after year giving the program the stable consistency and solid foundation it needs for continued growth. Without question, the addition of the Yurt in 2015 had a huge impact on summer camp growth and engagement. In giving our summer camps a place to call home, this unique space brings excitement each year to all participants. There is a sense of pride for our campers in knowing that this is their own special space and participants regularly invite their parents, families, and friends to walk out and see it. Even the JCRA staff look for opportunities to hold staff meetings and team building activities in the yurt. The added space has allowed for program expansion while increasing the rental availability of the Ruby C. McSwain Education Center where camps originally were held. We are still grateful to Richard and Amelia Lane and David and Karen Duch for making the Yurt a reality. Elizabeth has a strategic approach to education that starts with learning, sharing, and exploring effective ways to teach in a natural setting. In 2017, Elizabeth received certification as an environmental educator from the North Carolina Environmental Education Certification Program—a three-year endeavor—and that same year Project PLANTS transitioned to a JCRA summer camp for middle schoolers. Project PLANTS (Planting Leaders in Agriculture and Nature through Science) was a collaboration between the JC Raulston Arboretum, NC Cooperative Extension's 4-H Grow for It Program, and the Department of Horticultural Science. It was generously supported by a Student Science Enrichment Program Grant from the Burroughs Wellcome Fund, and was designed to increase students' excitement for the sciences while expanding their idea of horticulture from just gardening to the dynamic scientific field it truly is. Additionally, the program strives to connect middle school students to higher level education opportunities, and the pilot project has been a tremendous success. It only takes a short time interacting with the participants to recognize their smart, energetic minds at work. It's been exciting to watch this three-year vision become a reality as we transition out of the pilot project and make Project PLANTS a permanent part of our youth curriculum. 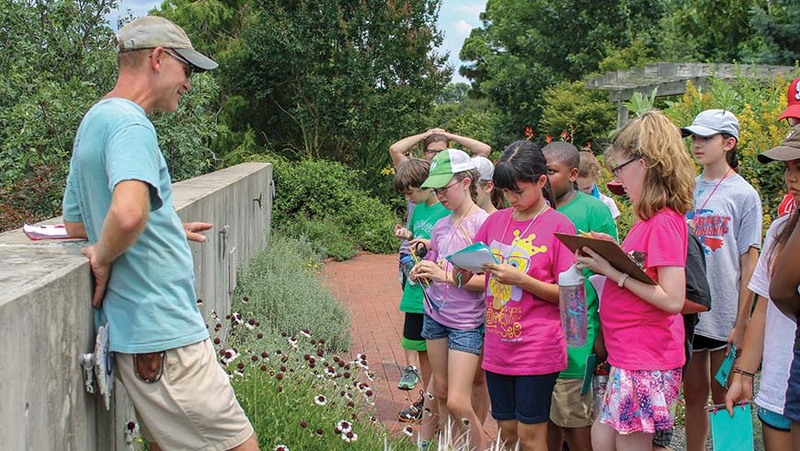 Former JCRA director Ted Bilderback, Ph.D., considers the youth program to be one of his crowning achievements at the Arboretum. 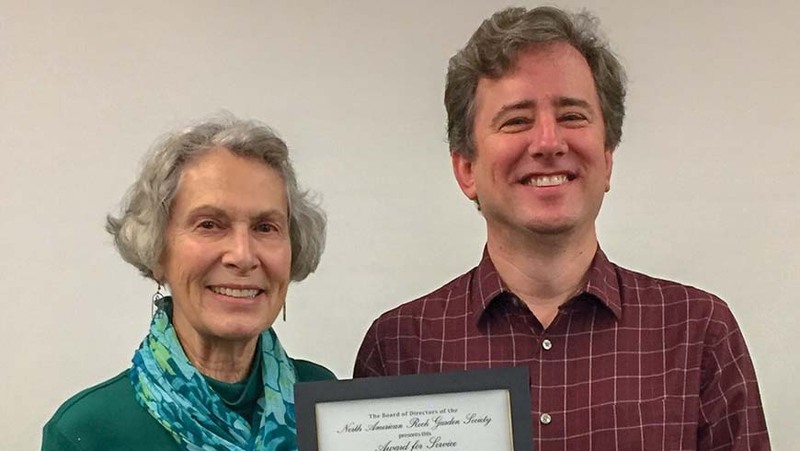 In recognition of how important teaching young minds about horticulture is, Ted and his wife Linda created an endowment to help fund the children's program in perpetuity. Along with the generosity of Doris Deal and the Deal Foundation, this support is what made the expansion of our summer camps possible and allowed Elizabeth the time to strategically plan and develop a vision to provide even more fun and active science-based programming to educate ages four through middle school. It is clear this program's success is driven by a belief in our mission and support from many of you. As you can see, J. C.'s mantra, "Plan—and plant for a better world" is alive, well, and deeply rooted in the Children's Program. Thanks to support from Doris Deal and the Deal Foundation over the last three years, we've been able to hire seasonal staff who developed and delivered additional summer camps and programs for children. We are so grateful for Doris for making such a difference in our ability to educate more young people about plants and provide them with meaningful natural experiences. 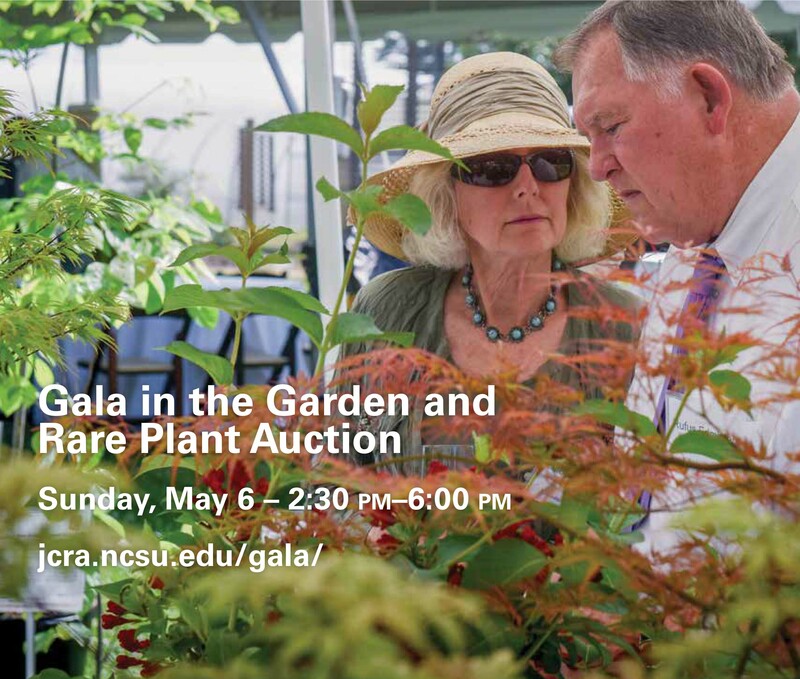 To explore ways you can support the JC Raulston Arboretum, please visit https://jcra.ncsu.edu/support/giving/. Triangle as an area of immense horticultural diversity and opportunity. Three organizations have chosen to hold their annual meetings for 2018 in Raleigh, where the JC Raulston Arboretum to taking a leading role in showcasing the area's amazing horticulture because of our importance to plant research and improvement of special collections. Focusing on growing the conversation, exploration, and conservation of magnolias, the Magnolia Society International (MSI) will host their 2018 Annual Meeting March 23–25. Cheryl Kearns, editor of MSI's publications and an annual meeting coordinator, previewed several activities: site visits to four area magnolia collections; special talks from leaders in magnolia research (including Tom Ranney, Ph.D., who leads the NC State Mountain Crop Improvement Lab research program, and keynote speaker Richard Olsen, Ph.D., director of the U.S. National Arboretum); and an all-new educational component focusing on the breeding and propagation of magnolias, which will be hosted here at the JCRA. Cheryl invited anyone interested in learning more about magnolias to come out for a fun weekend. Preregistration is required, but some aspects of the meeting are open, depending on seats available. 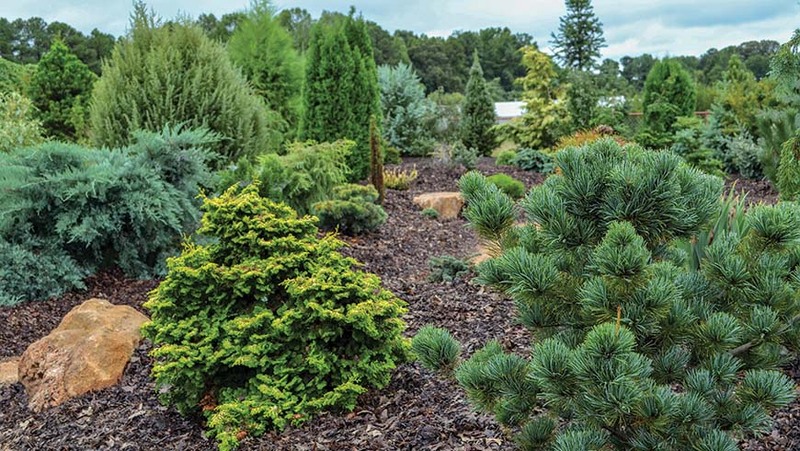 The American Conifer Society (ACS) is excited to host their 2018 National Meeting in the Southeast region once again June 14–17. Sandy Horn, Web and newsletter editor for the ACS Southeast Region, mentioned several items of interest at this year's meeting: tours of seven different area gardens; keynotes from research specialists and plantsmen such as David Creech, Ph.D., of SFA Gardens at the Stephen F. Austin State University and the JCRA's very own Mark Weathington; and an exciting silent auction of rare and unusual plants to support the growth of private collections and grant funding for ACS reference gardens like the one at the JCRA. Sandy encouraged all enthusiastic gardeners to come and learn about the beautiful variety, texture, and color that conifers can add to garden design. 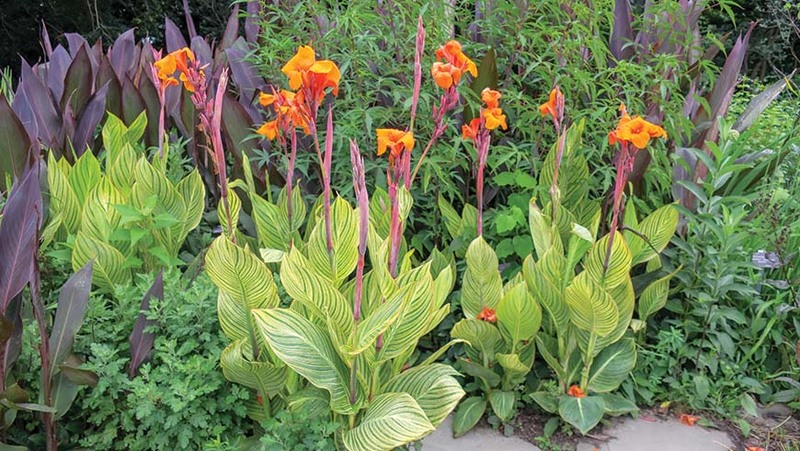 The Perennial Plant Association (PPA) hopes to showcase the Triangle's horticultural offerings while providing an opportunity for industry players to network at their 36th Annual Perennial Plant Symposium July 30–August 3. They're expanding their coverage through talks on ecology, pollinators, conservation, and green infrastructure and member-focused activities like a roundtable question-and-answer session with event speakers. The symposium will also sponsor networking through luncheons and dinners. Site chair Tony Avent confirmed that the JCRA is a major attraction on the list of tours planned for this year's symposium. "So many botanic gardens never change," he explained. "But the JCRA is very dynamic, and we are excited to show our attendees the JCRA gardens." While the topics are as varied as the plants that grow here, each conference will provide a fantastic introduction into the different horticulture topics that have an impact around the world, across the country, and here in our own backyards. 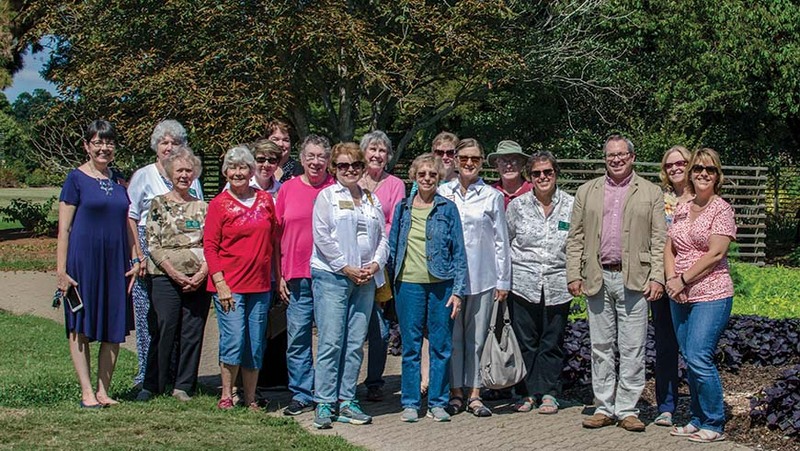 My job coordinating the JCRA's volunteer program allows me the privilege of interacting with many amazing people who contribute their time, skills, and energy to the Arboretum's success. In 2017, 308 volunteers contributed over 12,000 hours to categories of service such as gardening, staffing the Bobby G. Wilder Visitor Center, and helping to run events, projects, and children's programs. We also welcomed many new volunteers this year, like the Omega Phi Alpha service sorority at NC State who provided over 25 volunteers for Moonlight in the Garden. Other volunteers came to us through word of mouth, from our online volunteer interest form, or via Activate Good, a local volunteer clearinghouse. 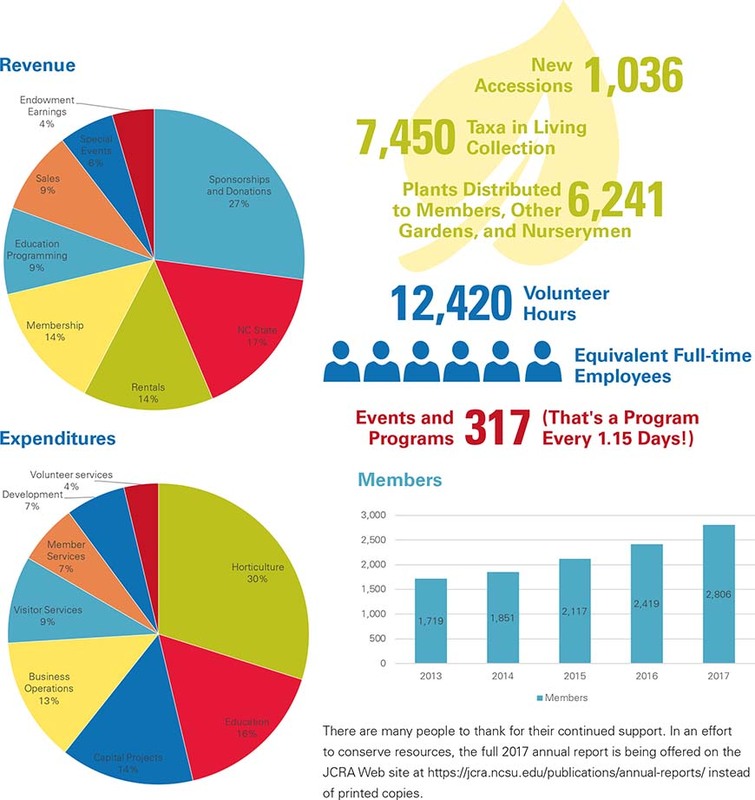 Last year, JCRA's strong volunteer program was featured on Activate Good's blog in an article that tells the Arboretum's story and captures some of the reasons why volunteers want to get involved. The entire article can be found at https://activategood.org/blog/volunteers-bring-beauty-to-raulston-arboretum/. This new year promises to provide just as many opportunities for service. We are excited to continue to partner with volunteers in new garden areas and for other program needs. Enjoy talking to people? Visitor Center volunteers are especially needed for weekend shifts and McSwain Center front desk volunteers are needed to greet guests and answer the information phone line during weekday business hours. Contact Kathryn Wall at kbwall@ncsu.edu or (919) 513-7004.